This easy four-ingredient chocolate fudge recipe doesn’t involve any cooking – just a bit of melting. This chocolate fudge looks and tastes great, and is a lot easier to make than you’d think. This is a Carnation classic! Ideal for a homemade gift. 1. Break or chop the chocolate into small chunks and place in a non-stick saucepan with the condensed milk and butter. Melt the ingredients gently over a low-medium heat, stirring occasionally until smooth and silky. (Want to know how to make fudge without a hob? You can also melt it in the microwave in 10-20 second bursts, stirring frequently). 2. Sieve in the icing sugar and mix thoroughly (you can use an electric whisk if you like). Press the fudge into the tin and smooth over the top with the back of a spoon. Press the nuts into the surface, if using. 3. Chill in the fridge for 1 hour until set, then cut it into squares. Store in an airtight container in the fridge for up to two weeks. For best results use chocolate with 50% cocoa solids. 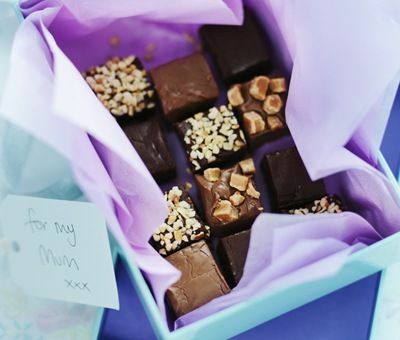 Try customising your chocolate fudge recipe by adding nuts, fruit or finishing with edible glitter or silver balls! Recipe contains milk, nuts and soya. What a fab recipe! I added dessicated coconut as a topping instead of nuts and it worked really well. Hi Gav, that sounds delicious! Always great to hear of Carnation baking successes! Im wanting to make a batch of orange fidge and another batch of buttersctotch fudge. Firstly how much orange extract should I add to the recipe? Secondly how would I make the fudge butterscotch flavoured. Hello Mohkam, half a teaspoon of orange extract will be just right but you could also try orange zest if available. Using a darker brown sugar instead of demerara will make a butterscotch flavoured fudge. Hello Zara, the chocolate used for this recipe will have an impact on the flavour. The level of solids is up to your preference. The set will be soft and creamy; we hope you enjoy it! Recipe works very well and you can add your own little twists like flavour extracts or make a rocky road with nuts, raisins, glacé cherries and Turkish delight or other combinations. Also works well if you swap the chocolate for white chocolate and mix in mashed up Oreos. Hi Rachel, we love your creative ideas! Can I make this using the caramel flavoured condensed milk? Also when I make this with white chocolate it is quite sticky. Any suggestions? Hello Viv, if you want to make this recipe with the Carnation Caramel then stir it until runny before using it as you would the Carnation Condensed Milk. This does change the flavour. Hello Sana, if you are looking for a smooth chocolate topping for your cake why not try the Carnation Chocolate Filling and Topping. It spreads on straight out of the tin for delicious finish! I made this with the addition of orange extract, went down well with family and friends. Thank you for this great fudge recipe. I made this at Easter and the whole of my family loved it, now I have orders of more fudge. Thank you once again. I made this less the icing sugar. Put it in the fridge over night and it was perfectly set the next day. It also tastes amazing! Never made fudge before so I was v happy! Made it last night. Not really disappointed with it but I did have to re heat and add an extra 50g icing sugar as to me it's just to soft without it. It's so easy to make tho. And I will use it again. I did use 2 Terry's chocolate orange with 100g milk chocolate and the flavour is amazing. I made this with dark chocolate, light condensed milk and marshmallows in top. Delicious. It also froze/defrosted perfectly. Yum. I have made this more times than I can count and it has worked every time. I've used milk chocolate, white chocolate, a very famous chocolate orange, toblerone, and my personal favourite rum and raisin!! I've mixed crushed smarties in to it and this weekend made it with fruit and nut chocolate, it always goes down a storm!!! Came out perfectly and was delicious. Added extra icing just to make sure, and it set nice and firm. Will make again. Made this last night and it was so easy! Thickened perfectly. I added an extra tablespoon of icing to ensure a good set but I wouldn't bother next time as it didn't need it at all. Left to set in fridge overnight and it was very firm by morning, no stickiness whatsoever. Trouble is, I made it as a present for a friend but I can't stop eating it! Think this must be the easiest and quickest fudge ever! Have made it twice now, adding different dried fruit and nuts eat time. It sets quickly so you need to spread it fast. Cuts up perfectly. Will be putting latest batch into cello bags to sell on out WI stall this Saturday! I made this with dark chocolate and with three spoons of peanut butter as other chocolate and peanut butter fudge recipes were really complicated. It was amazing! Everyone loves it there is no way it will last two weeks. This was lovely when I made it! I left it in the fridge to set overnight and it turned out fine. I've tried to make fudge before but it ends up turning into a big burnt mess but this recipe is nice and simple. I will be making this again for as part of a bake-sale, I know the fudge won't last long! Would this fudge and the ultimate fudge be ok to use as fillings for chocolates? Hi Zoe, Both recipes will work beautifully if you dip them in melted chocolate. Hi Nicola, this recipe needs the chocolate in order to set. If you don't want the chocolate flavour then try using white chocolate instead. You can also add vanilla essence for more flavour. How long will the fudge keep for? And how long should it be stored for? The fudge has set but seems a little sticky so worried the pieces will stick together when I bag them up. This easy fudge recipe is brilliant! very easy and we make it every xmas for gifts. This year I have used blueberry panna cotta chocolate which made amazing fudge! (almost tasted like turkish delight) I find the easiest way to flavour the fudge is to buy a flavoured chocolate bar, If the coco content isnt good i add 100g of 85% usually does the trick! never made a bad batch! Can you make this fudge with white chocolate? Hi Kate. Yes this recipe works just as well with white chocolate. This recipe s hopeless. Followed to the letter, the fudge did not set; it was soft, chewy and impossible to cut or handle it was so sticky. Am going to try your ultimate fudge - big disappointment. On the plus side, I rolled pieces of the mixture into balls, dusted with cocoa powder and sprinkled with glitter - chocolate truffles! Hi Pam57 sorry to hear you had a Fudge nightmare, although the truffles sound delicious! I've made this many time,quick easy and delicious! I've added glaze cherries on on batch, shortbread in another and try different things with it and always works out great. My question though is what is the expiry length on this. Not that it normally lasts that long, but would be handy to know. Hi Bev, it doesn't last long in the Carnation Kitchen either! This fudge can be stored in an airtight container in the fridge for up to 2 weeks. Ive tried this but it just won't set.... Help! Hi Lainey, try popping it in the fridge until set then cut into squares. Hi Alicat, an electric beater is definitley the easiest option. Otherwise start adding the sugar by folding it through initially, once it begins to incorporate give it a firmer stirring. I made this fudge last weekend and liked it so much that I bought more ingredients to make it again but this time I did it with white chocolate and chopped apricots. It was even more delicious than the plain chocolate fudge. I made the ultimate fudge as directed and it wouldn't set I only found crunchy Demerara sugar but don't think that would make much difference as it melted down I even left it in the freezer to try an work hard on it but sadly all that cost went into the bin the chocolate one came out fine I made plain and nutty ones for variety and the coconut ice was a big winner I cut it into chip sticks by adding the pink on top of the white and they dried better tasted yummy tried a few dipped in melted chocolate on one end so it was like having a bounty but mini stick size less cals in one hit. The peppermint creams went down a treat I barely got a look in. They got shared out to family as they loved them so much I use 10 capfuls of the natural peppermint liq oil it was for us strong enough but not over powering I brushed chocolate over half of each circle so it was soft one half and the fridge made the chocolate crunchy nice varient on the crunch into the smooth. Hi Penelope, sounds like you've been cooking up a storm! The secret with ultimate fudge is to make sure it cooks to a high enough temperature and then let it sit for a minute before beating it. Keep cooking up Carnation creations! Kirstie adds 3 table spoons of icing sugar which isn't near enough 100g stated here... Which one is correct? Mine is now setting in fridge and went for 3 tablespoons instead... Hope it works!! Hi Vikkie hope your chocolate fudge was a success! This recipe works wonderfully with 100g of icing sugar! Is there a way to make this diabetic friendly? Hi Claire, unfortunately we wouldn't recommend this for anyone with diabetes. Made this fudge a couple of days ago and took it into work. It proved popular! Incredibly easy to make and even easier to eat! I would like to try changing the flavour, can I use peppermint, vanilla or lemon extract? If so how much should I use please and when should I add to mixture? Thanks. Hi Miles, extracts are wonderful ways of getting variety but be careful as they are usually very strong. A couple of drops in a batch should be all you need add them just before you start beating so that it spreads evenly through the mixture! Love making this fudge. Usually for gifts although a large portion usually finds itself staying at home. So easy and quick to make. Sometimes do mine with crunchy peanut butter and always add mini marshmallows once everything is combined gives a fab marbled effect as the marshmallow melts. Currently playing around with a few other ideas for using the fudge and what to put in it. Love this recipe.So easy but only lasts half hour in my house. I do it with crushed biscuits for different texture. Delish. Made this the other day and it went down a treat! I am off to the shop later for more ingredients to make mor. Hi Avril, this recipe does need the chocolate. Why not try adding 2 tbsps cocoa to our ultimate fudge recipe? Just stir in with the other ingredients and bring to the heat as per the recipe. Enjoy! Can you use cocoa powder instead of chocolate in this recipe? Made this fudge the other day - it is just heavenly. Not quite like regular fudge but just as yummy and far easier. I think I may try using it as frosting for a chocolate cake one day and see what happens... Thanks for this amazing recipe. You're welcome Hannah! Wow that sounds like a really amazing cake idea! Made this fab fudge many times, always pleases. Decided to play with the ingredients...substitute milk chocolate for white chocolate and add a couple of table spoons of freeze dried raspberry. This is gorgeous, very popular with friends and family. Hi G (we're intruiged what does the G stand for?) Wow this version sounds incredible - top tip! I made this recipe with peanut butter and Nutella instead of chocolate and it was very tasty! Lots morw icing sugar needed to help it set though! Would it make a difference if i used carnation light condensed milk for this recipe? Hi Debbie, no you should be able to use either product no problems. Happy cooking! Many thanks for the info, I'm going to try Cherry Brandy, also adding some halfed cherries, I will let you know if it works. Hi Pam! So how did you get on? Hi Pam, yes you can add alcohol to this recipe but only in small quantities - we would suggest only up to 2tbsp alcohol as it will affect the setting. If you find it a little runny then you can add a little extra icing sugar. Sounds delicious - what flavour are you making? I made some of this last week and it was gone within seconds. Just about to make some more. It was so easy to make and tasted so good too! We made these last Christmas as gifts for teachers. They are so easy to make and were a great hit so we'll be making them again this year. Made this with my daughter,So easy!! She loved it! Cut into small pieces and everyone loved it,so made more this half term!! Hi Jo, mmm yummy how did the second batch go? Hi Lisa, oh dear.. We would suggest gently re-melting the mixture in the microwave and then adding another 50g icing sugar. Re chill. Or if you prefer re-melt the mixture, add 85g crushed biscuits, 25g dessicated coconut and some dried cranberries. Chill to set, then roll into balls and roll in more coconut. Chill or freeze until set! I've just made this off the recipe on the tin. Still a bit runny. Don't think I kept it on the heat long enough. Still not bad for a first go but you have to eat it with a spoon! Hi Louise, if you have any left you can re-melt the mixture and add a little more sieved icing sugar to make it thicker if you like! Or maybe serve it warm over ice cream! I have made this loads of times in the microwave with great results every time great for Christmas presents as keeps well in the fridge and takes to almost any topping to just love it . I just made this but the mixture was very thick making it difficult to mix in the icing sugar, should it have been? Hi Jane, yes it should be quite thick but if its too thick to mix, give it just a very gentle warm in the microwave - in perhaps 10 second bursts, stirring every now and then. That should make it easier. ive made the choco fudge and it turned out great and tasted heaven! i reccomened it! Im just about to make chocolate fudge! Wish me luck! FINGERS CROSSED! Easy Chocolate Fudge Recipe is rated 4.8 out of 5 by 26. Rated 5 out of 5 by Suki from Divine sweets Made it for the first time , with the help of my son, for family and friends as Eid gifts. Easy to make, absolutely divine and went down a treat. Since then, my son has requested it instead of a birthday cake! Friends are still asking for the recipe. A firm family favourite. Rated 5 out of 5 by Tiggy from Impressive present I have been looking for home made sweets to give as gifts for birthdays and Christmas. This fudge is perfect. I melted over hot water in a glass mixing bowl, this made it easy to mix in the icing sugar with an electric hand whisk. I finished with chopped walnuts on top. It took 2 hours to firm up in my fridge. I was very impressed. Next time I think I will add raisins soaked in rum. Would recommend. Rated 5 out of 5 by heathermarris from Absolutely incredible! I made these about a week ago and omg they’re amazing! Followed the recipe to a T except used several different kinds of chocolate as we didn’t have 400g of one kind, I pushed in 2 chopped up twix’s before they went in the fridge and my batch made 30 squares as me and my husband thought they’d be too small if I did 60 - they are heavenly. Next time I think I’ll add biscuit and raisins for a millionaires fudge! Rated 5 out of 5 by Zobudz from Absolutely Gorgeous! made these for my family a week ago, went down an absolute treat! about to make another batch! Rated 5 out of 5 by Natalie1985 from Easy to make, great results I have made this several times with different chocolate, dark, milk and white and even flavoured choc. I found that if melt the chocolate and butter then when that’s finished add the milk at the end just before taking off the heat to add the icing sugar you get best results. Rated 4 out of 5 by haventgotone from Not really fudge I made this because I saw it first on a Nigella's Christmas Kitchen video. I think really it is more the consistency of a really rich truffle and thus could easily be formed into a ball. I loosely followed the recipe because it needs a great deal of chocolate. I bought two bars of fair trade green and black's 70% dark chocolate which measured just over half the amount asked for so I halved the recipe.Expensive fudge. Also my tin of condensed milk read just over 400g not the just under stipulated. But I don't think it would make a great deal of difference. I think this should be called rich truffle as fudge means something traditional to me., and after several hours in the fridge I could still have moulded it into firm truffles and rolled it in coco powder etc. But I still managed to cut it up into fudge squares with ease without them losing any firmness at all and the taste was very nice as was the consistency.